Treat yourself to a full day spa where you can unwind, relax, and ‘center’. Then, feeling radiant and refreshed in mind, body and soul, sleep over with us and enjoy the luxurious elegance of The Venue Country Hotel. The package includes accommodation & our full day spa package. We all spend time helping others and working with others, and so for our own well being, we need to take a little time out for ourselves. This package is designed for just that. Treat yourself to a full day spa where you can unwind, relax, and ‘center’. Then, feeling radiant and refreshed in mind, body and soul, sleep over with us and enjoy the luxurious elegance of Velmoré Hotel. 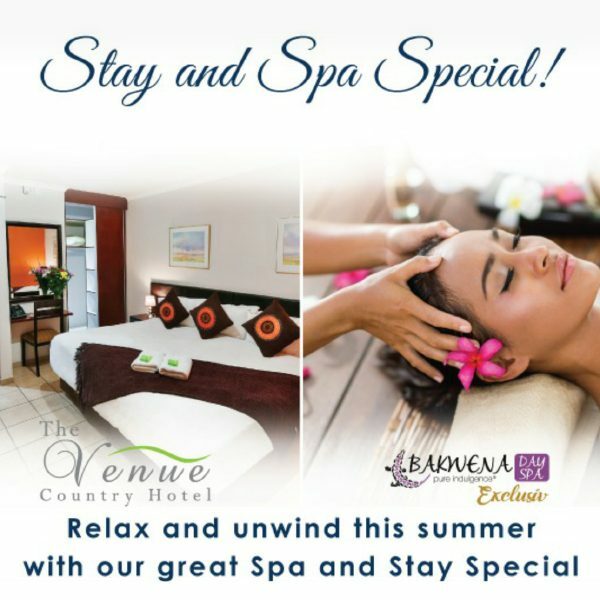 The package includes accommodation, breakfast (morning or full day spa booking), lunch (afternoon or full day spa booking), snacks and a limited complimentary bar. This package is subject to availability. Rescheduling within 3 days of your treatment date will result in a 25% forfeit of the full value of the booking. Rescheduling within 2 days of your treatment date will result in a 50% forfeit of the full value of the booking. Rescheduling within 1 day of your treatment date will result in a 100% forfeit of the full value of the booking. Cancellation on the day of a booking and/or ‘no-show’ will result in a 100% Forfeit of the full value of the booking. Bakwena Spa holds a strict NO REFUNDS policy. Nestled deep within the scenic Magaliesberg and Hartbeespoort region, lies The Venue Country Hotel which is a stunning retreat from the concrete jungle. A perfect finish to a perfect day – one that you deserve and one that will leave you feeling relaxed and refreshed with renewed energy. Enjoy our exceptional service where your wishes are our pleasure! Our feet, ankles and calves help us run, walk and jump. They work hard for our bodies and need tender loving care. To have a foot massage on sore feet can feel like heaven, let alone the wonderful relief one gets from a massage on your ankles and calves! Our massage helps heal and care for you by improving your circulation and blood flow and through it delivering nutrients to these parts of your body as well as lowering blood pressure. So whether you have just run a marathon, or about to, or even if you are not a sportsperson, this massage will help relieve and restore your lower legs, feet ankles and joints so you will want to jump for joy! Calming for the mind surprisingly deeply relaxing, ideal for the workaholic or those who endure mental as well as physical stress. Because we use our hands and arms in almost everything we do, it makes good sense to be kind to them to ensure loving hands can keep on giving. Enjoy this relaxing and soothing experience which relieves stress, pain or discomfort in arms, hands and wrists. Prepare your skin for the African summer with a full body exfoliation. Choose from a salt or sugar scrub, traditional mielie meal or natural body brush to leave your skin radiantly beautiful and soft. This desert plant is not only medicinally beneficial but packed with active compounds that nourishes, moisturises and protects – everything you want for your skin. Ancient Stones carrying the energy of the earth invigorate and stimulate the body as warm oils are drizzled over the body. Hot Stones then release the tension trapped deep within the muscles. A great warming treatment for anytime of the year assisting in pain relief and improved circulation. Light breakfast (morning appointment) or full lunch (afternoon appointment) and a snack platter. We encourage our clients to always drink responsibly. Form the time we steped foot inside we were treated like queens..
My partner and I had brought groupon vouchers for a night spa and it was an AMAZING experience.. Though we felt weird being in our gowns in a room full of ppl for drinks, diner and in between treatments but we soon forgot about that as the staff is super friendly and chatty..
We will definitely go back.. Thank you to every1 @ Bakwena for the superb service. Thank you for an awesome evening.